So I picked up the book The Kite Route: Story of the Denver Interurban Railroad at my local rockin’ used book store, Black and Read, yesterday. I collect various history books about Colorado, but mostly Boulder and Denver. It’s a neat book about the development and operations of the old commuter rail that ran a route between Denver, Broomfield, Louisville, Boulder, Marshall, and back to Denver. Not only is it a good general history, but I wanted to pick it up because I know Joe not only photographed the trains but he was killed by one. Near the end of the book, and appropriately listed with all the rail accidents, is a blurb about Joe’s death. The story goes that after meeting his son Samuel in Denver for the day Joe prepared to return to Boulder that evening on the train. His son bought the ticket but forgot to give it to Joe. On the way to Boulder, the conductor asked for tickets, but Joe realized he didn’t have the ticket and didn’t quite have enough money for the fare. So off the train he went to walk home. Most newspaper reports state he got off near the Globeville station (just north of Denver near the current interchange of I-25 and I-70). But the description in this book mentions that the conductor “put him off at Modern [station], located near present day Sixtieth Avenue and Pecos Street.” (1) Cool! New info to work with! That’s roughly half way between the Globeville and Westminster stations. What’s really spiffy is that the modern-day rail lines follow the approximate routes from 100 years ago. So I checked out Google Maps, and yup, some of the current tracks are still running in the same area. 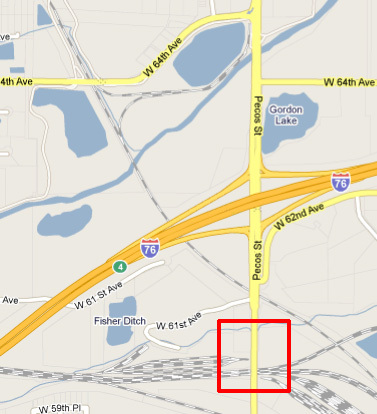 That puts the location of the Modern station just south of I-76 on Pecos. Obviously more digging in the Interurban Railroad papers are needed to find the exact location, but it’s at least a start! What happens to Joe after he gets off the train will never really be known. After Samuel realized he still had his father’s ticket he arranged for a conductor to take the ticket in the hopes he could pick Joe up if he saw him walking along the tracks. Around 11:25 pm, the crew found Joe, but unfortunately they found him about a half mile from the Modern station, dead near the tracks. They took his body to the Westminster station where they contacted the authorities and waited. 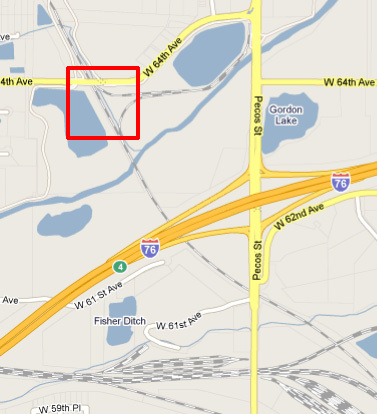 Approximate location where Joe's body was found. After an examination, the Adams County coroner only found Joe’s face bruised and bloodied and a broken left arm. He uncovered no evidence of foul play. The theory is that Joe tried to jump on one of the passing trains, fell, and died of shock on the side of the tracks. There is some speculation that he might have been intoxicated when he made his trek back to Boulder on foot. While there is currently no evidence for this, he had started building a reputation for imbibing a bit too much several years prior to his death. But my theories about that is an entirely separate post! So these new bits of information are exciting! First I need to find out if the Denver newspapers reported other information about his death than the Boulder papers. I thought I looked at them all, but obviously I must reevaluate that! Next, I hope to locate the Adams County Coroner’s records, that will certainly hold some interesting info. Then I need to find more records about the Denver Interurban to hopefully uncover more detailed maps of the route and stations. I’d love to get a good sense of where this Modern station really was. I think tomorrow I’ll take a little field trip and drive along Pecos and take some current photos of the sites I highlighted in the maps. I live in the general area so it will be a quick photo shoot. Look for a new post with new photos tomorrow! (1) William C. Jones and Noel T. Holley, The Kite Route: Story of the Denver Interurban Railroad (Boulder, CO: Pruett Publishing Company, 1986) 133. Other mentions of specific locations are also from this reference. This entry was posted in Denver, Joseph Bevier, Sturtevant and tagged colorado, history, research, sturtevant, trains. ← I LOVE Google Books!! !